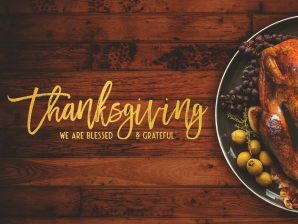 Please join us for a Thanksgiving Meal this Sunday, immediately after church, in the Lockwood Center gym. The Lord always provides enough food for this meal, because He is so gracious, and the Grace Street family is so generous. Please come, and bring a friend with you. If you would like to contribute to the food supply, bring a dessert. If you attend one of Grace Street’s youth or adult Sunday school classes, you already know your assignment. If you don’t, then contact your Bible study teacher for the details.